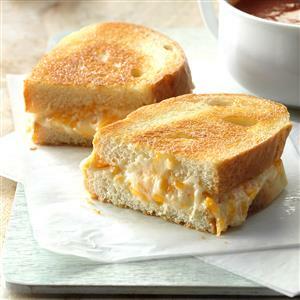 These gooey grilled cheese sandwiches, subtly seasoned with garlic, taste great with sliced apples. And they're really fast to whip up, too. I like to add a couple of slices of crispy bacon to the sandwich. Dovetailing Tip: Heat the bacon strips you cooked during Meal 1 in the microwave or toaster oven while making the spread. Assemble the sandwiches, adding 2 strips of bacon to each. In a large bowl, beat cream cheese and mayonnaise until smooth. Stir in the cheeses, garlic powder and seasoned salt. Spread five slices of bread with the cheese mixture, about 1/3 cup on each. Top with remaining bread. Butter the outsides of sandwiches. In a skillet over medium heat, toast sandwiches for 4-5 minutes on each side or until bread is lightly browned and cheese is melted. Yield: 5 servings.